There are numerous requirements that must be met by a debtor in a chapter 7 bankruptcy case. The debtor must complete a credit counseling session within 180 days of filing the petition. The debtor must complete a two hour personal financial management instruction course sometime after the case is filed but prior to the case being discharged. The debtor must provide the most recent federal tax return. The debtor must provide two months’ worth of pay advices immediately preceding the filing of the chapter 7 bankruptcy case. The debtor must appear at a 341 meeting of creditors and provide any additions or corrections that the panel trustee is requiring. In a select number of cases, the chapter 7 debtor is selected for an audit by an outside, third-party CPA or accounting firm. As if filing bankruptcy was not tough enough on an honest debtor. So the debtor has completed the requirements, faced the scrutiny of the chapter 7 trustee as well as the oversight from the United States Trustee’s office and yet still has work to do. The outside accounting firm is typically going to require 2 to 4 years of federal tax returns, six months of pay advices from all sources as well as six months’ worth of bank statements from every account that the debtor may have had immediately prior to filing. In a recent case, all of this information was submitted in a timely fashion to the auditor. The auditor then came back with additional requests and additional questions pertaining to specific items on the bank statement that exceeded $500. So my office is now going back to contact the debtor to attempt to acquire information about particular charges that were made nearly 6 months ago. The auditor will then make a final report and file it with the US Trustee and/or the court. Provided that there is not a significant deviation from the filed schedules compared to the audit results, the debtor will finally be entitled to his discharge. If on the other hand, there is a significant deviation or if the debtor does not comply fully with the auditor’s requests, the US Trustee may be forced by statute to bring a motion denying the discharge and dismissing the case. So as you can see, we have several levels of government that must be hurdled before a debtor subject to an audit can receive a discharge. 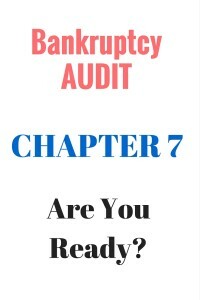 It all starts with the chapter 7 panel trustee, continues with the United States Trustee, is further complicated by the independent auditor and will finally end in a discharge if every party including creditors are satisfied that the debtor has complied with the United States Bankruptcy Code. Thankfully, these audits are few and far between. I can only imagine how many debtors would be denied a discharge if the audits were widespread. Debtors simply have a difficult time complying with the numerous demands surrounding a chapter 7 bankruptcy case. At one point several years back, debtor audits were eliminated based upon a lack of funding. However, if there’s a will there’s a way and the government always finds a way to pay for the things it really wants.